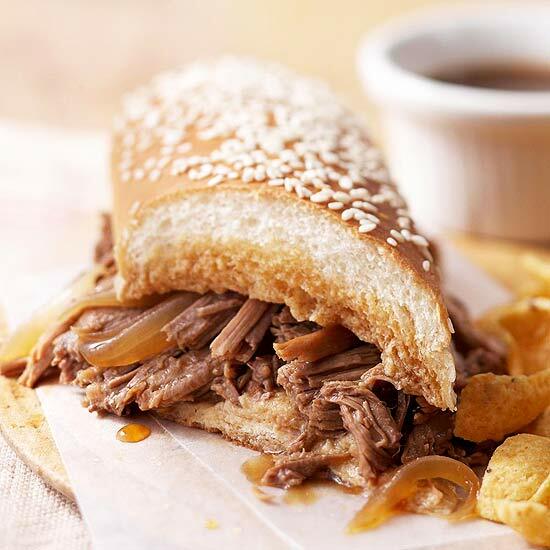 You are only five ingredients away from a delicious slow cooker meal with these recipes for sandwiches, chili, pasta, pot roast, ribs, and more. The photos are in are in order of the recipes listed below. Directions: 1. In a large skillet, cook ground beef and onion until meat is brown; drain off fat.2. 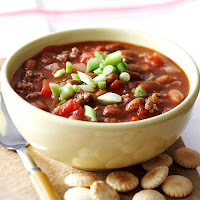 In a 3 1/2- to 4-quart slow cooker, combine ground beef mixture, beans, undrained tomatoes and green chiles, and vegetable juice.3. Cover; cook on low-heat setting for 4 to 6 hours on on high-heat setting for 2 to 3 hours. If desired, top each serving with green onions, sour cream, and/or cheddar cheese. Directions:1. Remove tops, membranes, and seeds from peppers. In a medium bowl, stir together chili beans with chili gravy, rice, and 1/2 cup of the cheese; spoon into peppers. Pour tomato sauce into the bottom of a 5- or 6-quart slow cooker. 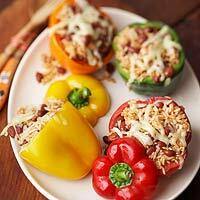 Place peppers, filled sides up, in slow cooker.2. Cover; cook on low-heat setting for 6 to 6 1/2 hours or on high-heat setting for 3 to 3 1/2 hours.3. Transfer peppers to serving plate. Spoon tomato sauce over peppers. Sprinkle with remaining cheese. Directions: 1. 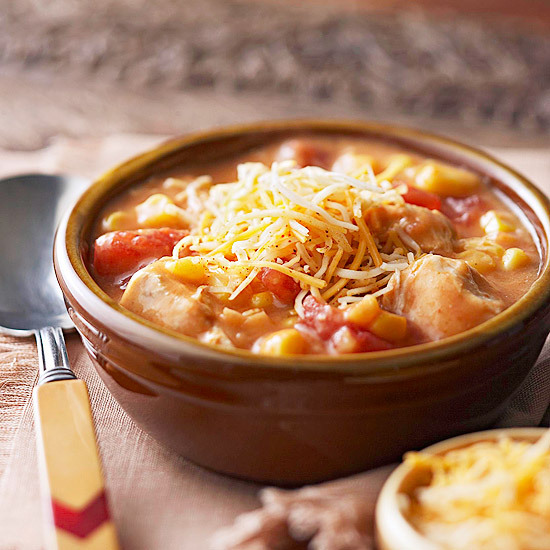 In a 3 1/2- or 4-quart slow cooker, gradually stir the water into soup until smooth. Stir in chicken, frozen vegetables, and seasoned pepper.2. Cover and cook on low-heat setting for 6 to 8 hours or on high-heat setting for 3 to 4 hours.3. If using low-heat setting, turn to high-heat setting. Stir in uncooked noodles. 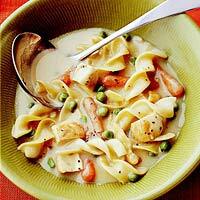 Cover and cook for 20 to 30 minutes more or just until noodles are tender. Directions:1. Trim fat from meat. If necessary, cut brisket to fit into a 5- to 6-quart slow cooker. Sprinkle spices from packet evenly over meat; rub in with your fingers. Place cabbage, carrots, onion, and potatoes in the slow cooker. Pour water over vegetables. 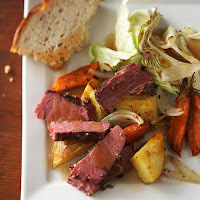 Top with brisket.2. Cover and cook on low-heat setting for 10 to 12 hours or on high-heat setting for 5 to 6 hours. Transfer meat to a cutting board. Thinly slice against the grain. Serve vegetables with a slotted spoon. Makes 6 servings. Directions: 1. 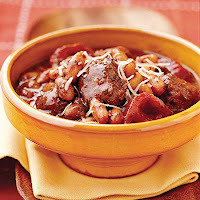 In a 3 1/2- or 4-quart slow cooker, combine undrained tomatoes, meatballs, drained beans, the water, and pesto.2. Cover and cook on low-heat setting for 5 to 7 hours or on high-heat setting for 2 1/2 to 3 1/2 hours. Sprinkle each serving with cheese. Directions:1. Trim fat from meat. In a large skillet, brown roast on all sides in hot oil; drain off fat.2. 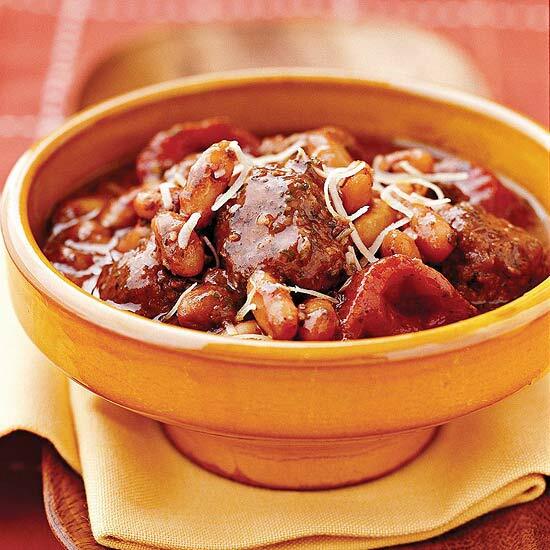 Place onions in a 5- to 6-quart slow cooker. Place meat on top of onions. In a bowl, whisk together broth, gravy mix, and pepper. Pour over meat in cooker.3. Cover; cook on low-heat setting for 10 to 11 hours or on high-heat setting for 5 to 5 1/2 hours. Transfer meat to a cutting board. Slice meat across the grain and return to cooker to keep warm. With a slotted spoon, remove meat and onions and serve on hoagie buns. Serve with bowls of cooking juices for dipping. Directions:1. In a 3-1/2- or 4-quart slow cooker, stir together chicken, undrained tomatoes, soup, and corn.2. Cover and cook on low-heat setting for 4 to 5 hours or on high-heat setting for 2 to 2-1/2 hours. Sprinkle each serving with cheese. Makes 6 servings.